It is never less than a joy to eat a crisp éclair that is filled with a well-flavoured centre and topped with a sticky icing! While chocolate éclairs should never be turned down, fruity éclairs are delightful to eat. 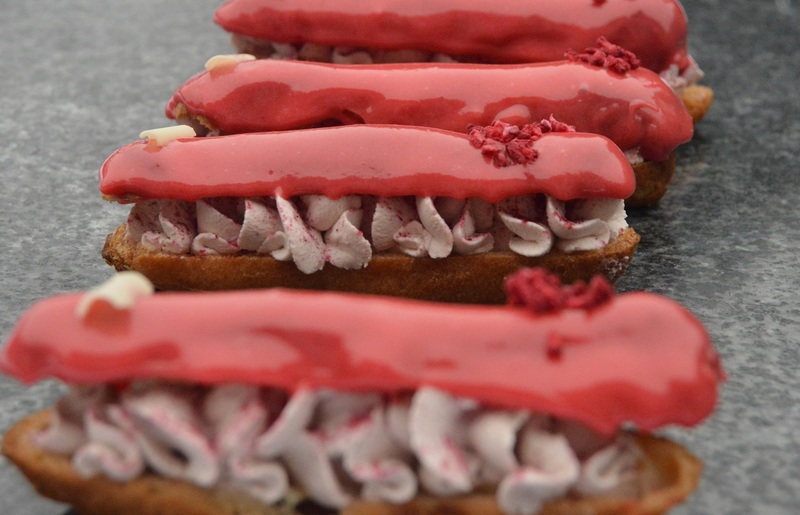 This time I have gone for a batch of blackcurant and raspberry éclairs: two very sharp flavours that actually don’t clash. I have gone for a blackcurrant cream filling and a raspberry topping, but both filling and topping can be just one flavour. I sometimes sprinkle white chocolate and/or dried raspberry pieces over the icing, but I have, on occasion, topped them with strips of white and raspberry chocolate. This is just melted white chocolate that is spread onto a baking sheet before sprinkling over dried raspberry pieces. Once set you simply break off shards or cut more precise strips eith a hot knife. 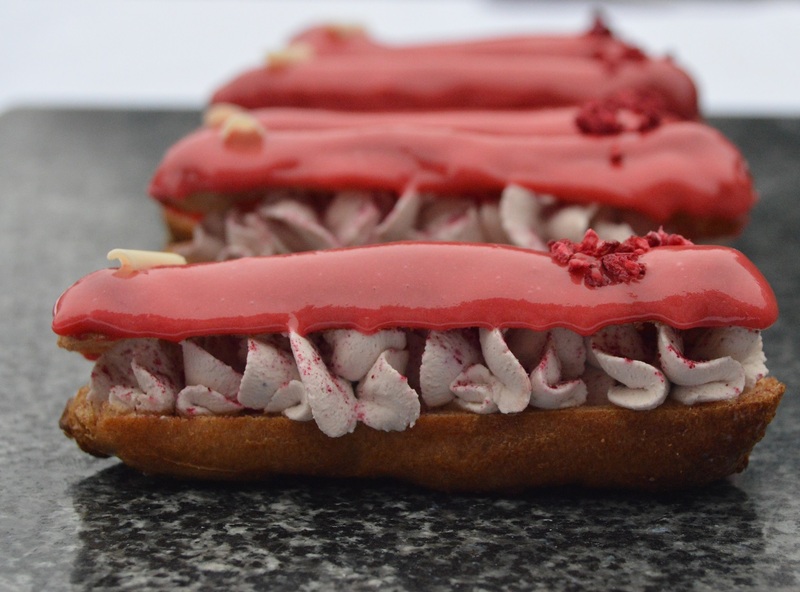 Using fruit from the freezer, I decided to make a batch of blackcurrant and raspberry éclairs: they are filled with a simple blackcurrant cream and have a raspberry fondant topping: vibrant, sticky and very tangy! Mind you, the flavours are only a guideline: you can go for one fruity flavour in the filling and topping or use whatever fruity flavours you want. The basic recipe for choux pastry is below: the use of strong plain flour rather than standard plain flour ensures the éclair is crisp and does not go floppy. It can literally be made up in minutes, before baking. For the icing, I used fondant icing sugar and raspberry purée, mixing to get a smooth and only slightly runny mixture before covering the tops of the éclairs with it and leaving it to set. I have also given below a recipe for crème pâtissière which can be used in the filling instead of the cream: although if using crème pâtissière I would add enough blackcurrant purée or blackcurrant powder to it to give the level of blackcurrant tang you want: personally, the tangier the better! 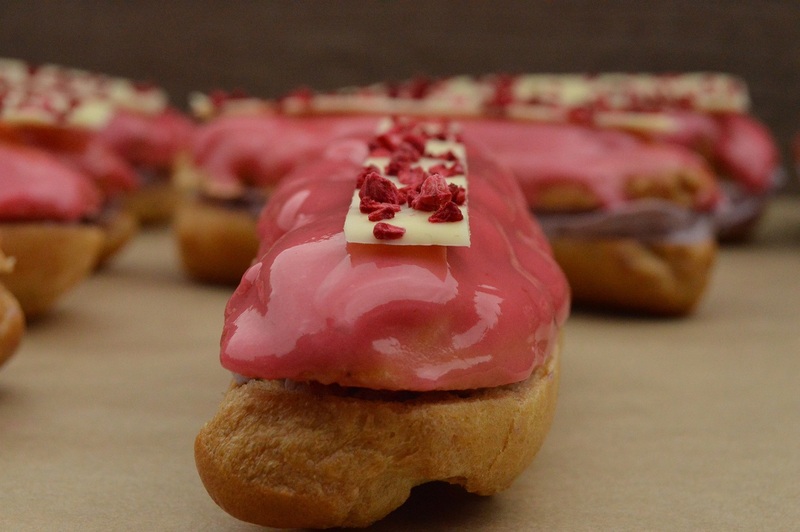 Recipe: blackcurrant & raspberry éclairs (makes approx. 40 small choux balls or about 15 large éclairs. 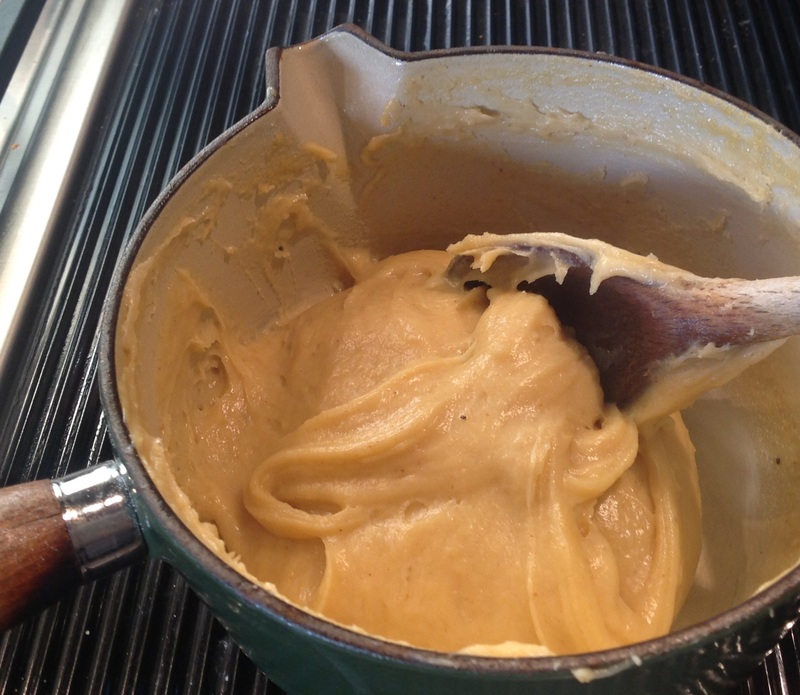 (2) Heat the water, butter, salt and sugar in a saucepan gently until the butter has melted. Turn up the heat and bring to the boil. (4) Add the eggs, a little at a time, beating well after each addition. You can use a wooden spoon or a hand-mixer. The paste will look unsightly to begin (slippery and it might seem as if it will not come together) with but with beating and after a few more additions it will become smooth and glossy (as in picture below). (5) Put the choux pastry into a piping bag fitted with a 1cm round or star nozzle and pipe pastry onto the greaseproof, ensuring they are well spaced. You can stick down the greaseproof with a bit of the pastry to stop it sliding about when piping. A wet finger can be dabbed over the ends to give smooth ends. Bake for about 25-30 minutes until well risen and golden brown (about 12-15 minutes or so for small choux balls). NB: turn the temperature down to 160C after 20 minutes if they are getting too dark. (6) Remove from the oven, pierce the base or sides of each pastry to allow the steam to escape (so that they do not become soggy as they cool): I insert the tip of a sharp knife and wiggle a little to give a couple of small holes. Place hole-side upwards to cool and then slice each horizontally with a serrated knife. (7) For the cream filling, whisk the cream, blackcurrant and icing sugar together until the cream is thick and holds it shape firmly. Spoon or pipe along the bottom halves of each éclair. Alternatively, enlarge the hole made underneath each éclair and pipe cream inside: the filling won’t ooze out of this hole! (8) For the icing, mix the icing sugar with enough of the raspberry purée to form a smooth mixture: you want it just a little bit runny but not at all liquid. (9) Dunk the tops of each éclairs into the icing, gently shake off the excess icing and place, icing side upwards, on a baking sheet or plate. Chill until set. NB: you can dunk them again to get a thicker layer of icing if preferred. (1) Whisk the egg yolks, vanilla seeds and the sugar for a few moments until pale. Add the flour and whisk in well. (2) Heat the milk in a pan until it comes to the boil. Pour it slowly over the egg mixture, whisking all the time to give a smooth mixture. Return to the pan over a low heat and bring back to the boil, whisking all the time. Let it bubble very gently for a couple of minutes before removing from the heat. (3) Transfer to a bowl, cover with clingfilm and beat in other flavours as desired (eg: orange or lemon juice; chocolate pieces, coffee, fruit powders, purées…..). Allow to cool until ready to use.